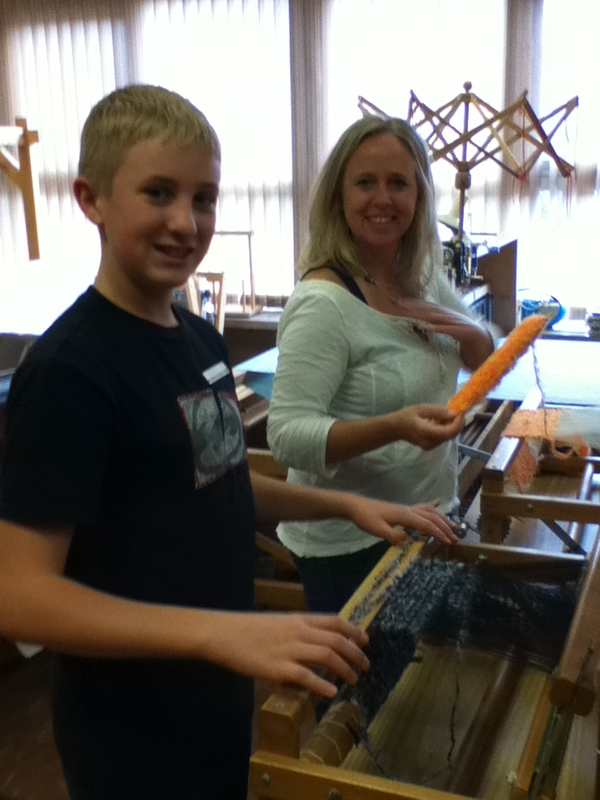 We regularly offer weaving and spinning courses as well as half-day scarf and tapestry workshops in the Guild. All of our classes are available to the public and our members. To maximize learning, we limit enrollment to six students per class and provide looms or spinning wheels to all participants. Advance registration is required. Contact us to register or learn more. Mother and son spend an afternoon together at a Scarf Workshop. Weave and take home a beautiful scarf while learning about weaving. Our scarf workshop is usually held on a weekend morning or afternoon. Children aged 10 and up are welcome if accompanied by an adult. Contact us with a group of two or more, and we’ll try to arrange a workshop at a time that’s convenient for you. 3 1/2 hours: $50 includes a choice of yarn. Mother and daughter take on a Tapestry Workshop. Weave a tapestry for yourself or as a gift! Learn some tapestry weaving techniques and weave your tapestry on a pre-dressed loom. Children aged 10 and up are welcome if accompanied by an adult. Contact us with a group of two or more, and we’ll try to arrange a workshop at a time that’s convenient for you. 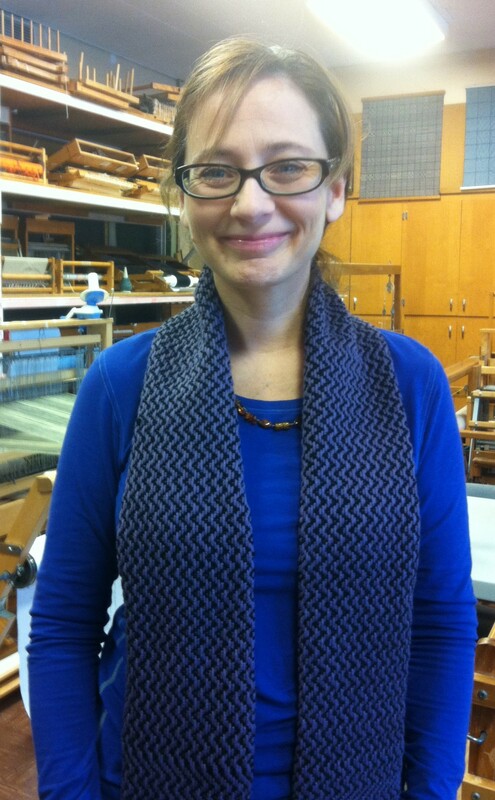 A Weaving I student models her first project. This course is for beginning weavers with little or no experience. Over six three-hour classes, you will learn how to plan a project and estimate the materials needed; how to make a warp and prepare a loom for weaving; and how to read simple patterns. You will experiment with different patterns and complete one project, usually a scarf. 6 weeks: $160 includes materials. This project-based course is for those who have completed Weaving I or have other weaving experience. Over eight three-hour classes, you will complete three or four projects using different materials, pattern techniques, and looms of various sizes. Typical projects include a cotton tea towel, a placemat, a table runner, a lap throw, or a small blanket. 8 weeks: $180 + cost of materials (~ $40). Over three two-hour classes, you will be guided through the steps of designing and planning your project, from drafting your idea to choosing weaving structures and colours and making yarn calculations. You can apply these steps to any project of your choice. This class does not involve weaving. 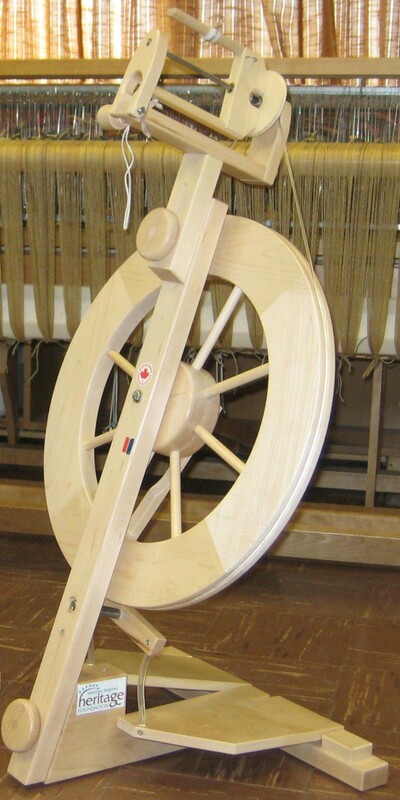 Participants can take home a spinning wheel during Spinning I. This course introduces you to the art of spinning. In six two-hour classes, you learn the basics of spinning. You also learn different drafting techniques with wool as the fibre. This course is suitable for anyone who would like to try spinning. No spinning wheel needed: you can take one home with you for the duration of the course. 6 weeks: $110 + cost of materials (~ $30). This course is for experienced spinners. Topics include: spinning a colour wheel, spinning with beads, blending a graded batt, maintaining your spinning wheel, novelty and specialty yarns; exotic fibres; Navajo plying; spindles; and more. Participants bring their own spinning wheel or drop spindle. 7 weeks: $150 + cost of materials (~ $8).